You have Sissinius by the sword O Word. 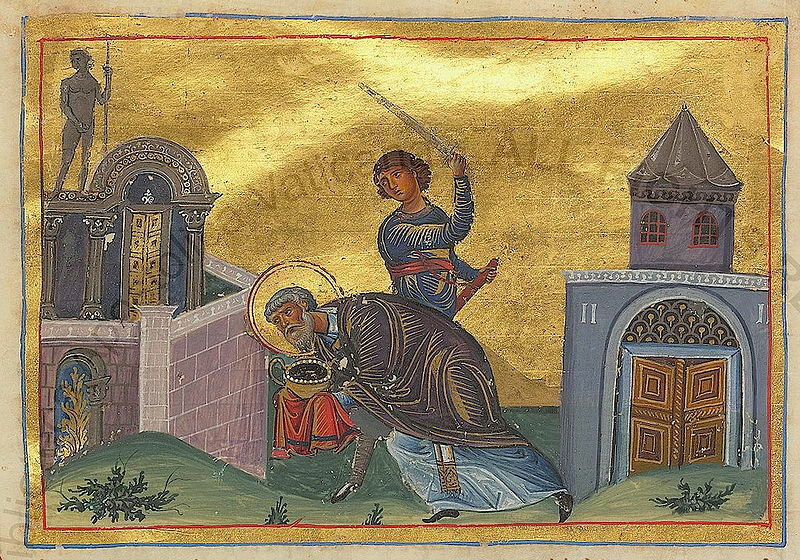 The Holy Hieromartyr Sisinnius was Bishop of Cyzicus during the reign of Emperor Diocletian. Having taught the pagans the Christian faith, and turning many away from the idolatrous error of their forefathers and bringing them to the Lord, he baptized them and established them firmly in the faith. Those who had been imprisoned for their faith in Christ and were being tortured, he would visit them, heal them, and encourage them to endure to the end. For these things he was brought before Diocletian, and he was first flogged and beaten. Then he was hung up and his sides were torn. Then he went back to prison where he suffered many other things, besides hunger and thirst. 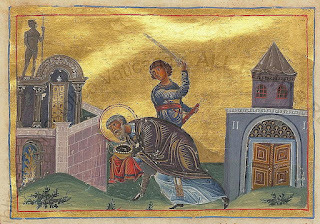 Removed from prison he was given one final chance to renounce Christ as his God, but he steadfastly refused, and for this he was put to death by the sword.